Parker: A YA novel about my experience growing up in the suburbs, my second poetry collection, and a trillion other things. In a previous interview with EKR, Britt said “everything is sound.” So if everything is sound, how would you describe yours? Or, disagree. Parker: I guess sort of like a playlist of Sun Ra and Sonic Youth? Some weeping in the background? What’s your favorite drink (besides FREE WATER)? Parker: Wine. Any wine and all the wines. 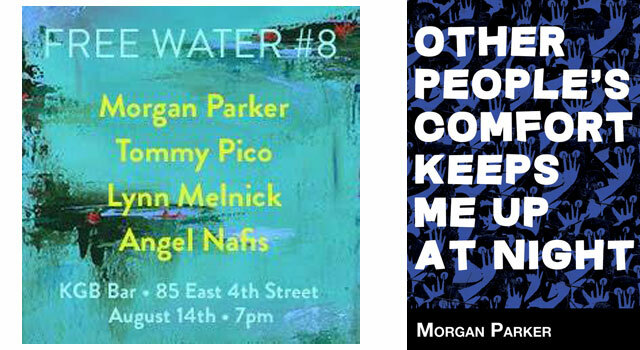 Find Morgan Parker online at www.morgan-parker.com, follow her on twitter @morganapple, get Other People’s Comfort Keeps Me up at Night from Switchback Books, and see her in real life at Free Water 8 on August 14th at KGB Bar. Follow Freewater on Twitter @FreeWaterArts.